1) How are Billing Cycles and Invoice Dates determined? Billing Cycles are a function of Start Date and Billing Frequency of Billing Contract and continue until the End Date of Billing Contract. The Invoice Date is always the next day of Cycle Start Date. This allows Partners to bill early while allowing them time to set-up the Billing Contract and the associated Subscriptions (until EOD of Billing Contract Start Date). 2) How is Invoice record associated with Account, Billing Contract, and Subscription? which in turn can have multiple subscriptions attached. Invoices are generated against a Billing Contract. Each Subscription is presented as a line-item on the invoice. Hence, invoice record will always be associated with a Billing Contract, Account on the Billing Contract and one or more subscriptions under the Billing Contract. 3) Which billing frequencies are supported by Work 365? Work 365 supports Annual, Quarterly and Monthly Billing. Please choose the correct Billing Frequency while creating the Billing Contract. As of version 2.0 Work 365 Supports one-time Non-Recurring Items as a Billing Contract Frequency. It is recommended that you have separate recurring and non-recurring Billing contracts. Non-recurring Billing Contracts support the invoicing for Non-Recurring Items. 4) While generating an invoice, the process says it completed successfully but no invoice was generated. Work 365 Invoice Engine will create an invoice when it finds at least one Active, Billable subscription on the Invoice Date for a billing cycle. The most likely reason is that the criteria are not met. Referring to the scenario above, the subscription came into effect on 15th Jan 2018. Hence, an invoice will be not be generated for the first Billing Cycle (1st Jan 2018 – 31st March 2018) since no subscription was in existence on the Invoice date (2nd Jan 2018) of that Billing Cycle. The engine derives the state of the system on the invoice date which helps to make the whole Invoicing process deterministic. It’s pretty intelligent that way! 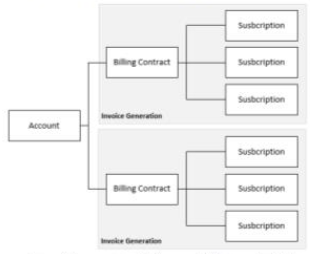 5) So how does one invoice subscriptions effective in the middle of a Billing Cycle? They will automatically get billed as change logs in the invoice for next Billing Cycle. The price will be pro-rated on the remaining period of the current Billing Cycle. Option #1 will most likely not be preferable especially for Quarterly and Annual Billing Contracts where the wait for the next billing cycle might be too long. That’s where the second tab Change Log Invoice on the Generate Invoice screen comes into play. This option will scan for un-invoiced change logs and generate a ChangeLog Invoice for them immediately. 6) What is the unit of pro-rate for Change Log subscriptions? Work 365 Supports two Pro-rate units: Months and Days. The default setting is Monthly. But, customers can change this to Daily through the Work 365 Configuration page. 7) How is the Pro-rate price calculated for ChangeLogs? When the Pro-rate unit is Months: The price is calculated for the number of months (rounded up) from the date on which change was made to the end date of the current Billing Cycle. As of Version 2.0, the pro-rate unit is always 1 for change logs. Changelogs will only be included in the immediate next billing period. It is absolutely important to ensure that change logs are included in the following month and for every missing Billing period a Manual invoice should be generated. When the Pro-rate unit is Days: The price is calculated for the “number of complete months and number of leftover days” from the end date of current Billing Cycle to the date on which change was made. 8) How to rectify the Price List Error (At least one price list should be available in the system for the subscription currency)? As inferred from the error message, create a new price List with the subscription currency in Dynamics 365, ensure its active and try again. 9) The on-demand Invoice Generation through Dynamics 365 UI is great. Can this process be automated further? Yes. There are two kinds of jobs that run against tenants and generate invoices automatically. Regular Invoice job: – This process runs early morning every day. It scans Billing Contracts for which Invoice Date falls on that date and generates invoices against them. This process is set-up automatically during Work 365 registration. Change Log Invoice job: – This process runs weekly towards the end of the week. It scans for un-invoiced change logs and generates change log invoices against them. This process is set-up automatically for Annual and Quarterly Billing Contracts. Please send an email to support@work365apps.com if you would also like to run it for Monthly Billing Contracts. 10) How is the reduction in quantities/suspension of subscriptions treated? Like increase, the decrease in the quantity of a subscription also results in changelogs. Negative change logs in the middle of the billing cycle will be refunded only if refunds are enabled*, otherwise, they will be ignored from the invoice. However, the reduced quantities will be considered for invoicing during the subsequent billing cycles. The same principle applies for complete deactivation of subscriptions within a billing cycle. If the net change is positive – Work 365 Invoice will charge for “net” increase in subscription quantity, not the individual increase in subscription quantity. If the net change is negative or zero – No charges will be applied for the increase in subscription quantity and refund will be processed for the “net” decrease in subscription quantity only if refunds are enabled*. *Refunds can be enabled/disabled at global level through Work 365 -> Configuration -> Invoicing -> Generate Refund. The same can be done at Billing Contract level through the “Process Refunds” field. Please note that the setting at Billing Contract level will override the global setting. 11) Work 365 Invoice shows different line items (with different unit price) for the same subscription even though it’s price has remained constant. How is that possible? This would be the case with change log items added at different points of the Billing Cycle. If the remaining period in the billing cycle varies across license changelogs, they will show up as separate line items on the invoice.